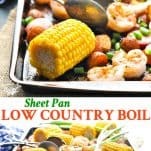 This Sheet Pan "Low Country Boil" is an entire dinner that cooks on one tray! With just 5 minutes of prep and a quick clean-up, it's an easy weeknight meal that's perfect for busy nights! 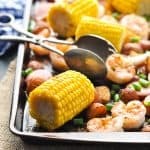 This Sheet Pan “Low Country Boil” is an entire dinner that cooks on one tray! With just 5 minutes of prep and a quick clean-up, it’s an easy weeknight meal that’s perfect for busy nights! 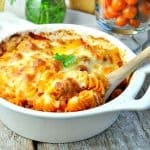 If you guys love my “dump-and-bake” dinners, then you’ll love this one too! We’re basically just dumping our ingredients on one tray and popping it in the oven…which means that it’s super-simple, and you won’t have many dishes to wash at the end. 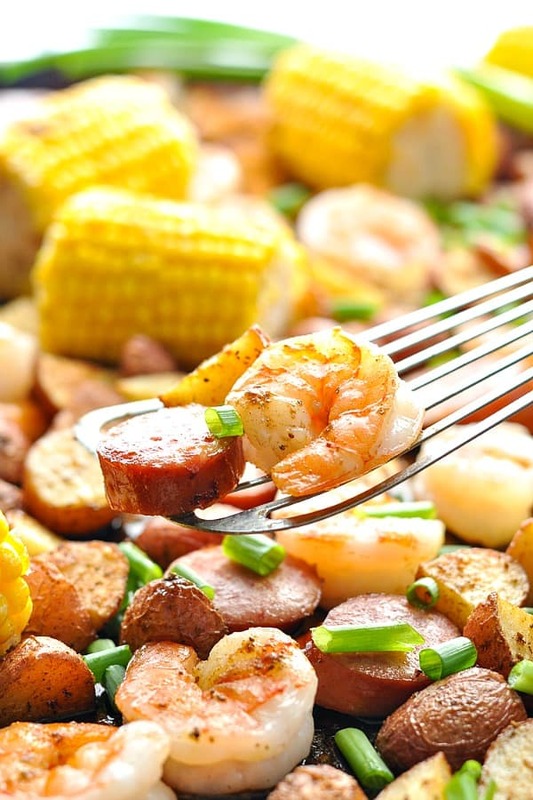 If you’re not familiar with the traditional Low Country Boil that Louisiana is famous for, it’s a seafood dish that combines shrimp (or crawfish), sausage, corn, and potatoes. It’s a one-pot meal that’s often cooked outside to serve a large crowd at social gatherings. There are many variations of the dish and it’s super easy to adapt with different veggies and seafood. 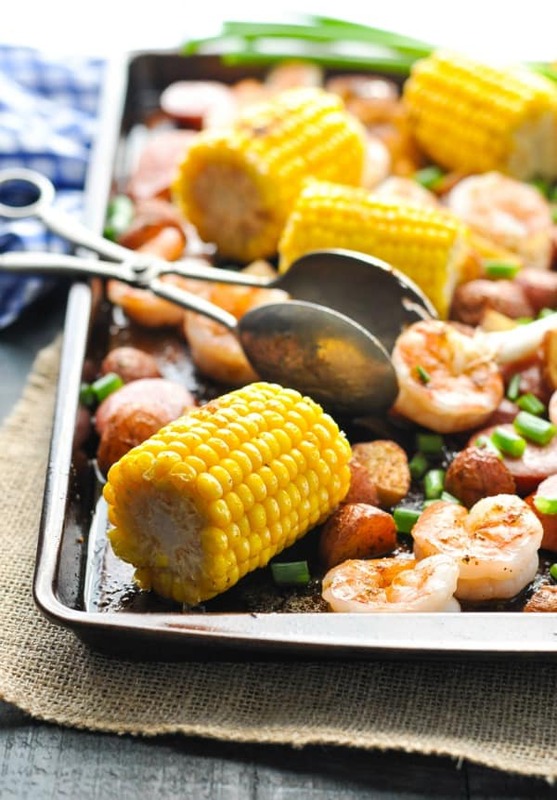 Technically, instead of a Low Country Boil, I should probably call the recipe a “Low Country BROIL.” We’re putting a twist on the classic recipe, and we’re not actually boiling anything! Instead, the oven does the work for us! 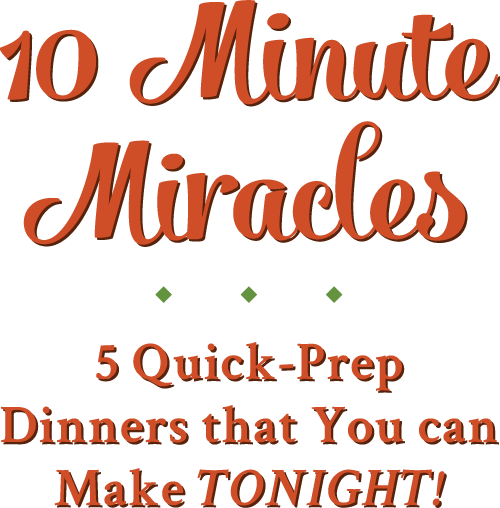 I’ve transformed the classic into an easy weeknight dinner that you can adjust to feed your family of 4, that you can scale down to serve 2, or that you can multiply to feed a party. There’s no outdoor campfire required, and I think that the crispy ingredients are even better than their boiled counterparts! This idea came to me last fall when I shared my recipe for our favorite 3-Ingredient Crispy Seasoned Potatoes. Y’all LOVE those potatoes, so I knew that you would appreciate an entire meal that cooks on the tray as your potatoes! 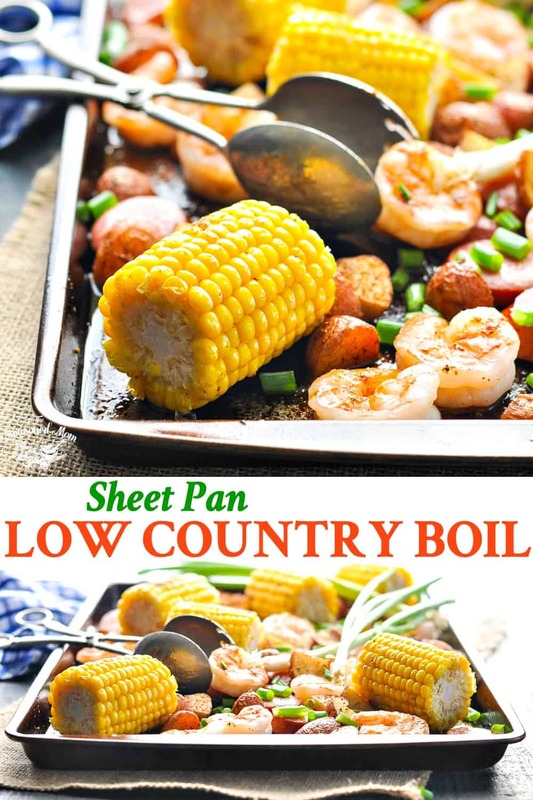 Since Keith loves to season his corn on the cob with Old Bay as well, this Sheet Pan Low Country Boil instantly came to mind. 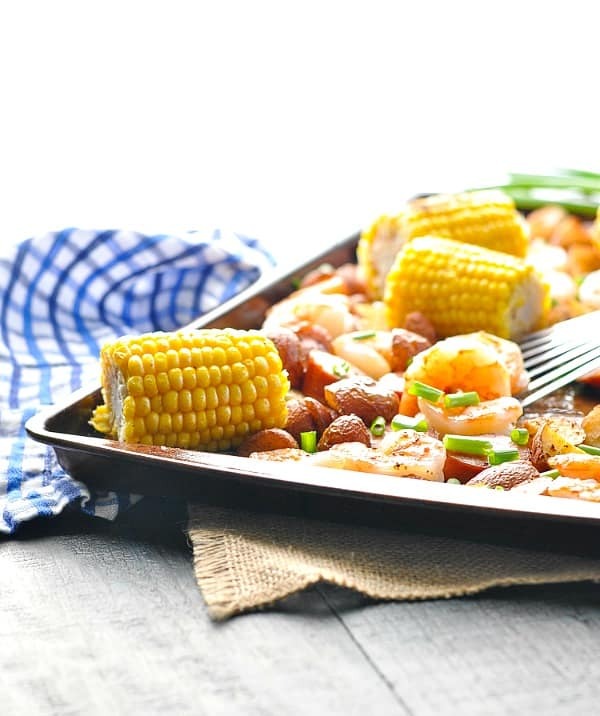 It combines the Old Bay corn and the potatoes, along with crispy sausage and tender shrimp. This seriously melts in your mouth!!! 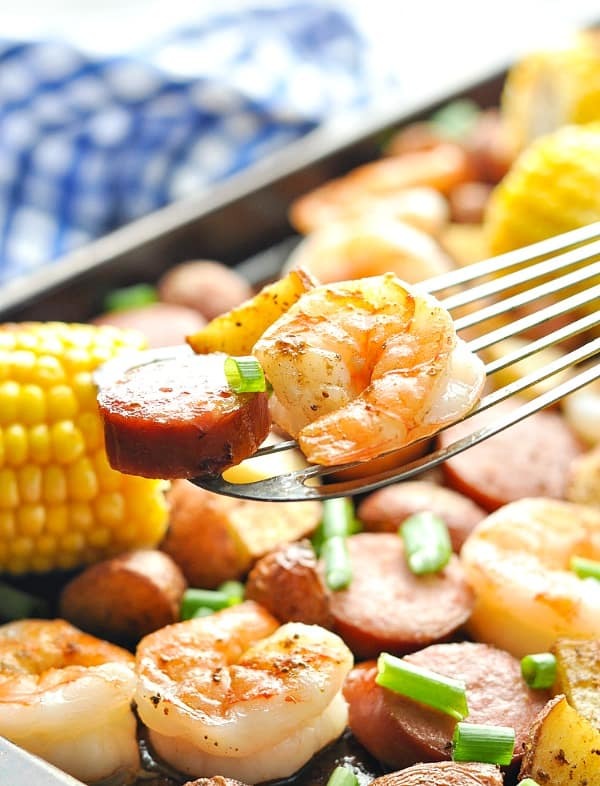 This low country boil is just bursting with flavors and would go great with some cornbread or a biscuit on the side. If you’d prefer something fresher and low carb then go for a big fresh salad which would also work really well! I used a package of frozen Bird’s Eye Mini Corn on the Cob, which came with 6 mini ears (so I didn’t have to cut them in half). If using frozen corn, thaw first before using it in the recipe. I like to use Jumbo shrimp (16-20 shrimp per pound) for this recipe, since it’s larger and has a slightly longer cooking time than smaller shrimp. This way it doesn’t get overcooked while the other ingredients finish baking. 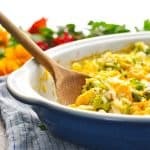 Leftovers will store well in the fridge for 2-3 days and can be eaten cold or reheated. You can even use leftovers to make a hearty soup or stew. Preheat oven to 425°F. 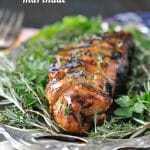 Line a large sheet pan with parchment paper or foil and spray with cooking spray. Place potatoes in a large zip-top plastic bag. In a small bowl, whisk together 2 teaspoons of Old Bay seasoning and 2 tablespoons of olive oil. Pour oil mixture into zip-top bag, seal shut, and gently toss to coat potatoes. Spread seasoned potatoes onto prepared baking sheet. Bake for 10 minutes, stirring with a spatula halfway through. Remove pan from oven. Stir potatoes again. Arrange the corn cobs in a single layer around the potatoes. Brush corn with about 1 tablespoon of melted butter and season with a dusting of Old Bay. Return the pan to the oven and continue baking for another 10 minutes. Remove pan from oven. Stir potatoes and corn. 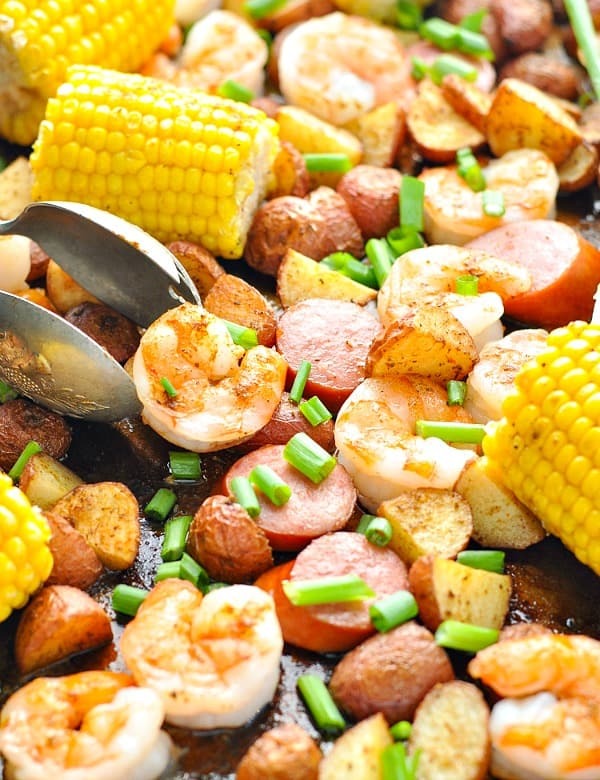 Arrange the sliced sausage and the shrimp around the potatoes and corn on the tray. Brush shrimp with remaining butter and sprinkle with Old Bay. Return the pan to the oven and continue baking for another 10 minutes, or until potatoes are crispy and shrimp is pink. This looks amazing, Blair! I’ve never made a boil before, but I do love all of the ingredients and have got to try this! Love that you made it an easy sheet pan meal! My husband would gobble this right up. Pinning this beauty! Thank you, Gayle! 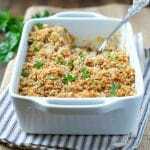 It’s so delicious — my husband LOVES this meal! 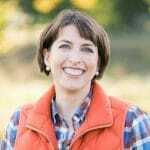 I hope you’ll give it a try, and thanks for the pin! My kids don’t like seafood (I don’t know who’s kids these are). Could I use chicken? If so I plan to cook both!! OMG this came out soon good! It was delish Blair and the entire family enjoyed it! Since I have little kids I used less of the spice on the shrimp and boiled them their potato but the rest of us loved the recipe !!! Yay! I’m so happy that you enjoyed it, Kim! Tried this last night and my guys loved it. No leftovers from this one. Yay! That’s great to hear. Thanks, Joan!